Provides updates on city events, activities, issues, etc. 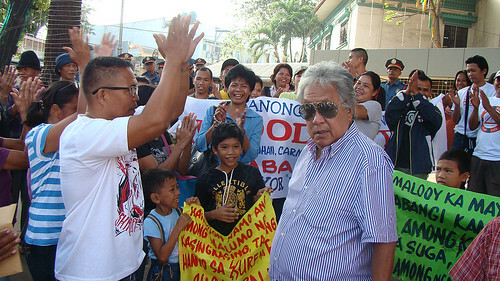 A group of flood victims from Creekside, Macanhan, Carmen broke into applause after Mayor Vicente “Dongkoy” Y. Emano gave them assurance of the one thing they sought audience with the Mayor for –- the re-connection of (electric) light for their homes. Perhaps, taking their cue from the Night Cafe/Night Market group which a week ago also sought audience with the mayor and got a favorable response, the Creekside, Macanhan residents who called themselves the “Yanong Lungsoranon” likewise marched into the City Hall grounds and sought the attention of the Mayor right after the flag raising ceremony. Of all things they could ask, they focused only on asking the Mayor to help them have their electric lines reconnected to their homes so they could have light again especially during the evening. The students who live there, for one, need this light the most at night. Thus, as with the night cafe group, their applause rang loud when the Mayor, after conferring with Eng’r. Goldmar Fiel, assured them of a reconnection. Daghang salamat mayor emano sir kay nabalik na amo kuryente dri sa macanhan creekside. Click on above link to see emergency numbers.